Harry Kane scored 79 seconds into his England debut and Wayne Rooney moved a step closer to Sir Bobby Charlton's all-time goalscoring record in a routine Euro 2016 dismissal of Lithuania at Wembley. Kane - with 29 goals for Tottenham this season - emerged as a substitute after 70 minutes with England already on the way to a fifth win from five qualifiers with goals from Rooney, Danny Welbeck and Raheem Sterling. The stage was set for the 21-year-old but even the man with the Midas touch in front of goal this season would have struggled to believe he would score with his third touch as a full England international, heading in Sterling's cross at the far post. Rooney got the night off to the perfect start when he headed his 47th goal for England after only six minutes, leaving him just two adrift of Charlton's tally ahead of Tuesday's friendly against Italy in Turin. Danny Welbeck - 8. "Deserved to keep his place and made it six goals in this Euro 2016 campaign. 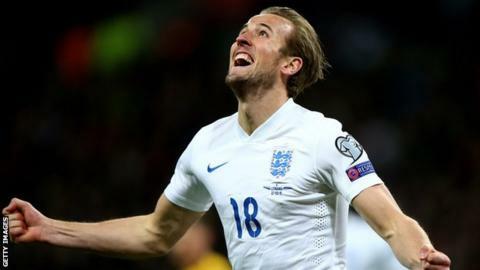 Plenty will now call for him to be left out for Harry Kane - but has been excellent for England." England's captain also hit the woodwork twice before man of the match Welbeck, who deservedly kept his place despite public clamour for Kane's inclusion, headed a deflected second just before half-time. Sterling was rewarded for a lively performance with his first England goal - but it was Kane who did what he has been doing all season and stole the show with a predator's effort as part of a confident cameo. Hodgson refused to rush Kane into his England starting line-up despite his golden run of form but he will be delighted that he has demonstrated, albeit briefly and against desperately poor opposition, that he is an added weapon in his attacking armoury. In the wider context of Euro 2016, Lithuania provided further proof of how England have been handed a gloriously favourable group in which to continue their rehabilitation following the World Cup debacle in Brazil. There could never be any excuses for not reaching France. Rooney started the night with Charlton's record firmly in his sights - and could have equalled it by the interval. He was put through by Fabian Delph in the third minute but slid a low shot against the post with Lithuania keeper Giedrius Arlauskis beaten. Rooney was not to be kept at bay for long, and he took another stride towards that landmark three minutes later with a simple header from six yards after Arlauskis blocked Welbeck's shot. A looping header against the woodwork and a low free-kick clutched by Arlauskis continued Rooney's efforts - but it was Welbeck who ended any fanciful suggestion that this might develop into a serious contest with England's second from a deflected header right on half-time. It was little more than a procession and Arlauskis distinguished himself again with a superb save from Delph's volley and a Welbeck snapshot as England resumed the siege. The gallant keeper was powerless to stop England adding a third just before the hour, Sterling's simple tap-in the perfect conclusion to Rooney's inviting cross. The moment Kane, and indeed most of Wembley, had been waiting for arrived with 20 minutes left as he was introduced, along with Everton's Ross Barkley, for Rooney and Jordan Henderson. And in keeping with the rest of his season, he penned the final chapter of this Wembley storyline on a dream England debut. Match ends, England 4, Lithuania 0. Second Half ends, England 4, Lithuania 0. Foul by Vaidas Slavickas (Lithuania). Donatas Kazlauskas (Lithuania) is shown the yellow card. Foul by Donatas Kazlauskas (Lithuania). Corner, England. Conceded by Georgas Freidgeimas. Substitution, Lithuania. Donatas Kazlauskas replaces Saulius Mikoliunas. Offside, England. Harry Kane tries a through ball, but Theo Walcott is caught offside. Vaidas Slavickas (Lithuania) wins a free kick in the attacking half. Attempt missed. Fabian Delph (England) left footed shot from the centre of the box misses to the left. Assisted by Leighton Baines. Substitution, Lithuania. Vaidas Slavickas replaces Vytautas Andriuskevicius because of an injury. Raheem Sterling (England) is shown the yellow card for a bad foul. Delay in match Raheem Sterling (England) because of an injury. Delay in match Vytautas Andriuskevicius (Lithuania) because of an injury. Vytautas Andriuskevicius (Lithuania) wins a free kick in the defensive half. Hand ball by Karolis Chvedukas (Lithuania). Substitution, England. Theo Walcott replaces Danny Welbeck because of an injury. Corner, England. Conceded by Marius Zaliukas. Attempt blocked. Danny Welbeck (England) right footed shot from the centre of the box is blocked. Assisted by Harry Kane. Attempt blocked. Gary Cahill (England) header from the centre of the box is blocked. Assisted by Leighton Baines with a cross. Attempt blocked. Raheem Sterling (England) right footed shot from a difficult angle on the left is blocked. Goal! England 4, Lithuania 0. Harry Kane (England) header from the right side of the six yard box to the bottom right corner. Assisted by Raheem Sterling with a cross. Offside, Lithuania. Georgas Freidgeimas tries a through ball, but Deivydas Matulevicius is caught offside. Substitution, England. Harry Kane replaces Wayne Rooney. Substitution, England. Ross Barkley replaces Jordan Henderson. Foul by Fabian Delph (England). Saulius Mikoliunas (Lithuania) wins a free kick in the defensive half. Substitution, Lithuania. Simonas Stankevicius replaces Tomas Mikuckis. Raheem Sterling (England) wins a free kick in the attacking half. Foul by Karolis Chvedukas (Lithuania). Attempt missed. Deivydas Matulevicius (Lithuania) right footed shot from outside the box is high and wide to the right. Offside, England. Danny Welbeck tries a through ball, but Jordan Henderson is caught offside. Marius Zaliukas (Lithuania) wins a free kick in the attacking half.